Modern Marketing Experience (MME) is an annual event hosted by Oracle Marketing Cloud in Las Vegas, Nevada. Televerde was a Bronze sponsor for this event and it took a team to absorb all the latest and greatest marketing insights, OMC product updates, network for leads and have fun. At #MME16, we heard a lot about the vision of integration of modern marketing strategies, the human expertise needed to execute and the technology to put the customer relationship first. The underlining theme to make this possible is the utilization of available data sets and marketing technology tools to enhance the customer experience. The passionate gathering of marketing gurus reminded each other to stay focused on the customer need, not your product, as you work to transform your marketing organizations with the Oracle Marketing Cloud. Amongst many others, the audience heard this message from Oracle CEO Mark Hurd; GM, Oracle Marketing Cloud, Kevin Akeroyd and Catherine Blackmore, GVP Client Success. Here are some key takeaways from the conference. 2016 has been a big year for Eloqua so far. Users have already experienced the new fresh UI that is the first of many updates to come. Program Canvas. Program Builder is getting a new look and functionality including advanced workflows, integration and data management. 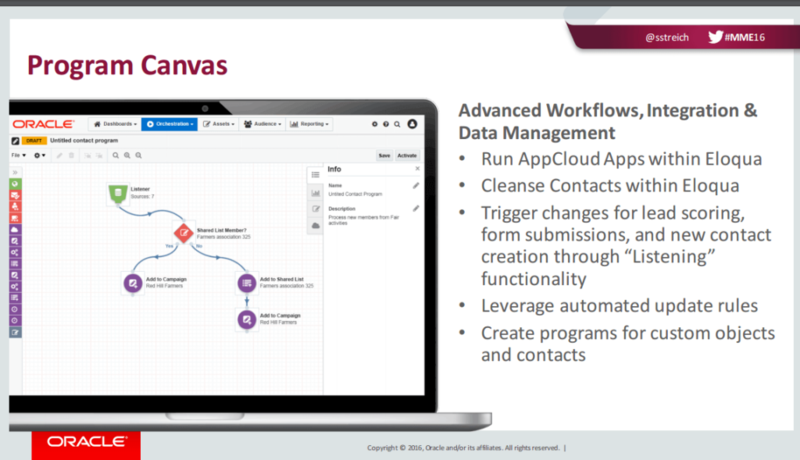 This includes creating programs for custom objects and contacts, trigger changes for lead scoring, form submissions, and new contact creation through “Listening” functionality, and AppCloud Apps within Eloqua. Reporting & Analytics. The next generations of interactive dashboards that will allow individuals to drill into segments and channels for more visibility. Plus, individuals will be able to pull Custom Data Objects data into the reports. The analytics will be using the depth of Oracle BI to get a better visual of the activity within the systems. New Contact Washing Machine. Every great marketer knows the key to results is having clean and accurate data. Oracle has revolutionized the process of implementing complex contact washing machines with their new app. The New Contact Washing Machine App simplifies the process of cleansing your contact fields by providing the functionality to trim, append and more all in one place. Studies show that when companies implement and utilize ABM for at least a year, 60% had increased revenue of at least 10%, while 19% showed an increase of 30% or more according to Demandbase. By tapping into their eco-system, Oracle Marketing Cloud is looking at taking scoring and targeting to an account level. By partnering with Mintigo, 6sense, Demandbase and Lattice, OMC will leverage their predictive analytics to score accounts based on their actions and intent. Based on this intelligence and direction from sales, marketers can build targets for better exposure. Throughout the conference, we saw how the Oracle technology and tools helped enhance the customer experience through case studies and even the Markie Awards. But the technology…is just a tool. It takes the human touch to nurture and convert in the B2B world and those success stories all reinforced the importance of an enabled sales development representative that has the right, relevant conversation at the right time. People remember how you make them feel and every experience matters. Thanks #MME16 for all of the great information but also the entertainment like speaker the internet YouTube sensation Zack King and also watching bands including Bastille and The Goo Goo Dolls. Keep an eye out for the big updates coming up next quarter to include deep dives on Reporting & Analytics, as well as the extension of Sales Enablement with Oracle’s Eloqua Sales Tools for mobile devices. As always, share your questions with us by tweeting @televerde, or comment on our LinkedIn page. To get in touch with one of our certified Eloqua consultants, contact us today.